Square Enix has released a TGS trailer for Final Fantasy XV‘s upcoming multiplayer expansion – Comrades. Due out October 31, players will set foot as a survivor from Kingsglaive to find out more about the disappearance of Noctis after the events in Chapter 13 from the main game. The trailer features a brand-new track from series main-stay Nobuo Uematsu. Titled “Choosing Hope,” the track is sung by Japanese singer Emiko Suzuki and can be previewed below. The expansion will be available to all who have purchased the game’s Season Pass and requires a subscription to PlayStation Plus or Xbox Live, depending on your platform. Players can also purchase the new game mode separately at launch. Posted in Comrades, Final Fantasy XV, Tokyo Game Show 2017. Looks good to you then pay SE more money so they can complete the game and it’s story LMAO. Is this meant to insult me in anyway? I mean I bought the season pass on day 1 so I already gave all the support I need to. This does look pretty decent, but I wish this was single-player content tbh. 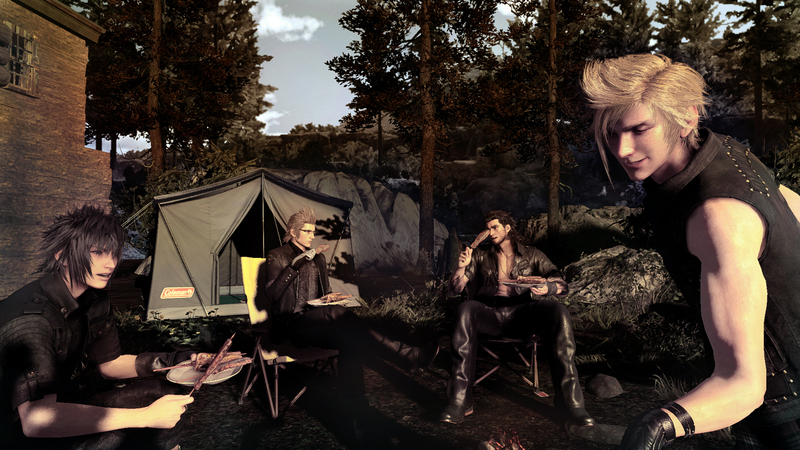 Seeing all the old faces return, I’d rather have been able to just run around with Ignis, Gladio, Prompto, Cor, Iris and Aranea. Really hope that they implement some features from Comrades into the main game. Still “meh” about this, will likely play around at launch but it will probably have even less longevity as the main game itself. Screams desperate attempt to keep people playing the game, that they finished in a week or two and never picked back up, or sold. The MMO mentality they have with this whole game has been really odd, I’d much rather they accept it’s a single player RPG, people will play, keep it and come back to play again years down the line or sell. It doesn’t need to be plugged every few months with filler content. Even Nobuo Uematsu doesn’t seem to be able to create a decent track for this. Like this whole project is with cursed mediocrity and bad decisions. That’s a valid point about GTA Online keeping those GTA V retention numbers (I wouldn’t say it saved Rockstar, however. Rockstar didn’t really need saving!). I didn’t even make that connection, I guess because, to me at least, GTA lends itself to online group play. Final Fantasy, or at least XV, doesn’t. After hearing this song, it makes me wish Uematsu was able to make the main theme for FFXV instead of giving us a cover of Stand by Me…. Gameplay looks sick!!!! Such a shame that a custom avatar handles magic better than the king himself whom need to craft elemental grenade to use magic attacks. I can’t wait to play this, I hope it occurs through the 10 years gap and not just the very beginning so that we finally get to see older Iris, the Demon Slayer. My only grip is the theme song… its sounds too much like the FF14 themes sung by Susan Calloway which I can’t stand. Seems totally disconnected of the rest of the OST. Even the character episodes music felt more coherent. Nobuo does better with instrumental tracks. The latest OST I liked from him was FF14 1.0, and they had to ditch most of his material for A Realm Reborn, which was a total shame. I miss his pre-FF10 days. I feel the same about the theme. They should have just let Shimomura to do it. I mean I adore Uematsu as much as the next but he’s moved on. I wish they’d stop calling him in for vocal themes and give the new composers a chance. Also agree with them ditching the 1.0 stuff. I love Masayoshi Soken’s 2.0+ soundtrack and wouldn’t trade it for anything, but I hate that Uematsu’s work was just deleted. His battle themes were far superior, and the rest of his soundtrack was great too. Some of it’s been repurposed in later dungeons but I wish they’d just bring it all back. Hardly negativism, I tend to offer as balanced of an opinion of the game as I can in most cases. In fact I was saying how on the fence I was about the whole thing within the first sentence. I’m well aware this will increase the life of the game for a lot of people, which is great. But also feel that time is being spent on something which won’t take off as the team are hoping, especially with the glaringly obvious issues with the main game itself which should be their first and foremost priority. Add multiplayer expansions, extra hunts, festivals etc as much as you want. They’re a great addition, and gives players more to do if they’re still interested in the game. BUT make sure the game you’ve made in the first place is the best it can be first, no?